This is a recipe from Jamie Oliver’s book, Save, which I had in the UK but had to leave there. It was absolutely delicious and a recipe that everyone must have. Unfortunately I couldn’t remember it exactly so I started searching for it online and finally found it on the DizzyLizzyFood blog. Jamie Oliver’s version uses butternut squash which to Antipodeans is pumpkin. I however like it with sweet potato, but feel free to substitute whatever you like. I’ve never felt that recipes should be followed precisely but instead adapted to fit taste preferences and whatever ingredients you have on hand. Cut the sweet potato into little cubes and roast until golden. Then fry the chopped onions, raisins, cinnamon and chilli in olive oil for about 20 minutes on a low heat. You will need to add a bit of water to the pot every now and again to stop it boiling dry and sticking. Now add the sweet potato, olives (chopped), chickpeas and chopped tomatoes, stock cube and one cup of boiling water (add more if it starts to dry). Simmer for about 40 minutes until thick. Cook the couscous just before the stew is ready and serve together with the remaining coriander sprinkled on top. 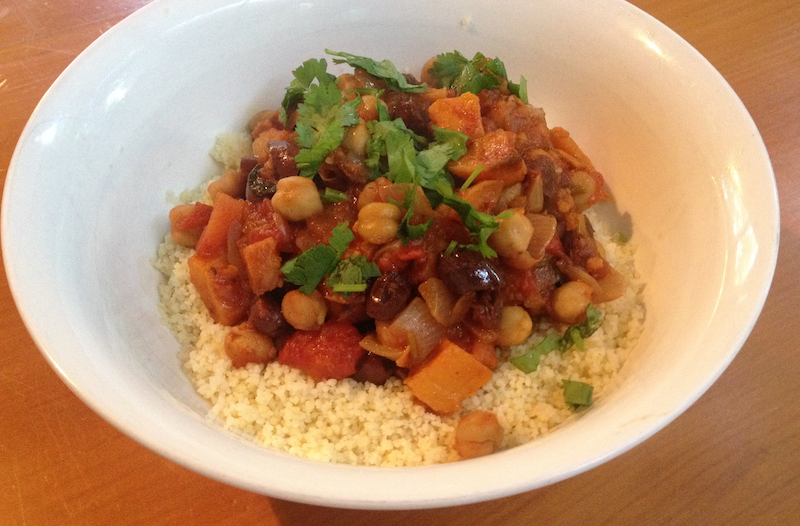 Posted in Recipe and tagged chickpea, pumpkin, recipe, recipes, Sicilian, squash, stew, sweet potato, Vegan, vegetarian. Bookmark the permalink. I’m really enjoying your cooking segments. I had no idea that there could be such variety in vegetarian and vegan diets. Good, I’m glad. I’ll continue to add recipes as I think of them. I’ll run out of steam eventually I’m sure. That looks marvelous to make. Thanks. It’s really yummy. I definitely recommend giving it a go. That looks nice! What do you call the big round pumpkins? I think that’s a a patty pan squash for us too!